An amazing night, with a lovely, kindhearted, generous crowd, for a great cause. We gathered at Mountain Gate Country Club to celebrate our wonderful supporters and raise more fund for KCIS students. Ms. Shohreh Aghdashloo on the stage with Ziba Shirazi, and Shahrzad Sepanlou - singing and dancing for the Kids. THANK YOU ALL 3! Three ladies singing and dancing to entertain KCIS guest to support children's education. At the end of the night things got really festive with Ziba Shirazi, Shohreh Aghadashloo and Shahrzad Sepanlou getting into it. Shohreh Aghdashloo joined us later in the evening. Started a beautiful dance with our volunteers at the stage. THANK YOU Ms. Aghdashloo aziz! Shahrzad Sepanlou: Beautiful, Beautiful Person, Beautiful Voice. The beautiful Holly Salmasi-Abrishamchian with her elegant mom Mrs. Salmasi. Our volunteers -- where would we be w/o them? After Firouz Naderi's talk our volunteers went into the crowd holding flags each with a name of a young boy or a young girl waiting to be sponsored. Good kind hearted people in our audience reached out to select a flag and sponsor a child. We had 50 flags and they were all gone within 5 minutes. 50 more kids who now have a chance at a better future because of their benefactor half a world away. Cost of sponsoring a child is $50/per month or $600 per year. Firouz Naderi who could not get out of the bed that morning with a painful lower back pain wrapped his back tight and showed up anyway saying "you go the extra mile for the kids". Firouz Naderi shared stories of two of the KCIS kids. Auctioning 2 bottles wine and a private tour for 4 at Darioush Winery donated by Mr. Darioush Khaledi. Ziba Shirazi telling the story of Jila Kashef founder of KCIS. Multi-talented Ziba Shirazi was the master of ceremony. The beautiful Dr. Parmis Khatibi. If it is a good cause you will normally find her there. Payam Banazadeh -- is a KCIS volunteer who runs our Facebook page. He is headed for Stanford next year and the entrepreneurial hotbed of Silicon Valley. He has a can't-miss prospect and we are so proud of him ........ and yes he will continue his volunteer work on behalf of KCIS. Dr. Parvin Kassaie -- She sponsored a child that night. On the right Dr. Ali Habibi a generous supporter of KCIS. Sitting in front of him his lovely wife Shabnam. Right, Dr. Bijan Motameid (KICS old timer sponsor of few kids), on the left Dr. Hooman Melamed. Last year KCIS gala was at the beautiful Unici Casa owned by Mr. Michael Foroutan. 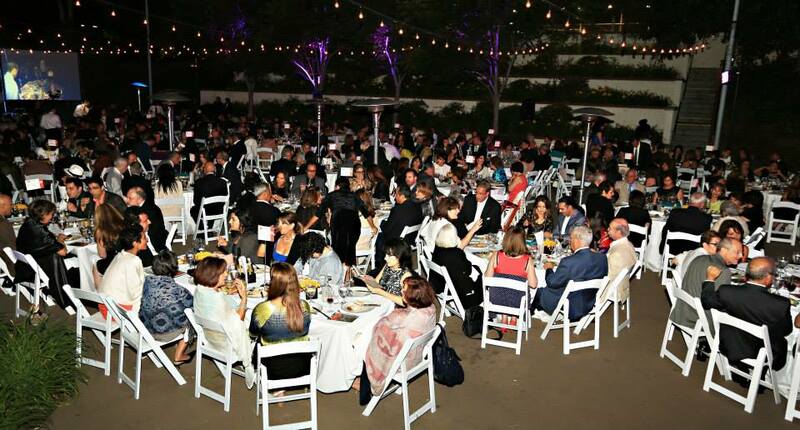 This year's KCIS Gala was at the beautiful Bel Air Country Club (Mountaingate). During the cocktail hours before dinner and the program guests milled around the park-like grounds chatting with friends. Our guests tell us that this social hour and catching up with the friends is a part of event they really enjoy. Firouz Naderi and Mohsen Dibaie are both on the Board of KCIS. On the right, Ms. Dawn Sepideh Mortazavi, Esq, KCIS board of advisory. At far left her mom, Dr. Minoo Saiedvafa. In the middle to the left old time friend of KCIS, Ms. Farah Mir next to Jila Ajeli Kashef. Sina is an entrepreneur on his way up. Like to tap into 2% of his future earnings for KCIS -- that would be huge. :-) Thanks for coming Sina Mobasser we need young supporters. Cheshmak from Orange county always offers her volunteer services at KCIS events. THANK YOU! If there is a worthy cause in LA you can usually find Mr. & Mrs. Abrishamchian there. The very classy lady on the right is Holly's mom, Mrs. Farah Salmasi, also new sponsor at KCIS. THANK YOU! Shirin Fouladi, another beautiful, young , intelligent KCIS sponsor with her brother Faribourz Fouladi joined the Gala from Sacramento. Right, Dr. Bijan Motameid (old time sponsor of several KICS kids) next to him his beautiful wife "Payvand" - Middle Jila Ajeli Kashef and to the right Dr. Hooman Melamed. Dr. Laden Behnia one of KCIS generous supporters. Dr. Pooneh Soltani, old timer sponsor with her beautiful niece Shiela. Guests were welcomed with champagne. Oh yes we did run out …….. but people who were there to support the kids didn't seem to mind. Mrs. Zohreh Fatemi, a long timer KCIS sponsor of few kids with her entire family, with her husband "Farokh". Dokhi Mirmirani - The best florist artist in LA. Mehrnoosh Kianpour - absolutely a dedicated volunteer, a very talented graphic artist with her handsome husband Shahrokh. Mohammad Gharavi - he is the KCIS landlord -- sort of. We have taken over his garage at his home and turned it into KCIS LA headquarters. However, he is giving us evacuation notice -- :-) as he is renovating his home. Any one has a one room office for us in a commercial building? Rent free of course. Any expense we save goes to the kids. Mrs. Fereshteh Tavakoli the head of Society for Children with Cancer (ISCC) -- another angle in our Iranian-American Community. Mrs. Sally Dibaei, one of the dedicated volunteer, who not only offers her time and $, but her beautiful home to KCIS friends for any gathering!! Next to her is Payam Banazadeh, another dedicated KCIS volunteer, who manages KCIS FB. Thanks to BOTH of YOU! Earlier that day our volunteers get last minute instruction. Mona, Sima, Ardavan Shirazi, family member of Ziba Shirazi with their friends. Jila Kashef and Peter The Persian. Soudabeh Tehrani -- one of the 50 caring people who sponsored a child that night. Kevin DeCorso -- an outstanding young Iranian American athlete and a scholar going to U Pen. Shohreh and Houshang arrived late (after a wedding). As told by Diba Salimi: "I've got my reasons to believe that my late mother, Nahid, pointed me to this lady!! Jila Ajeli Kashef the founder of Keep Children In School Foundation , a true living angel♥ There are so much light and love around her. Her personality and energy filled the whole golf course as she entered the charity gala on June 1st. Her story and dedication reminded me again that supporting education is the one and only way we can achieve enlightenment. It is the absolute duty of people like me and my friends who had been surrounded with the love of their families all along, to support our next generation and to insure the equal opportunities for our children's education. Jila's foundation KCIS is providing that opportunity for you and me to share our power and help the next generation of kids in Iran who are utterly smart and talented but are missing school for their difficult circumstances. Roya Yazdani, a long timer KCIS sponsor (who's child started with us when she was in her 5th grade. Jasmin is now studying chemical engineering. Next to Roya, is Dr. Farnoosh, joined us at the Gala and become a new sponsor. Thank YOU! These functions are possible because of our young dedicated volunteers. Their energy and dedication rubs off on the rest of us. What a bunch of good looking young volunteers. Mr. Shahab & Mrs. Sima Taraji. Jila Kashef founder of KCIS and Ziba Shirazi Master of the Ceremony for the night. Ensieh Tasdighi-- She has two daughters of her own but she is also a sponsor of a KCIS kid. Thx.